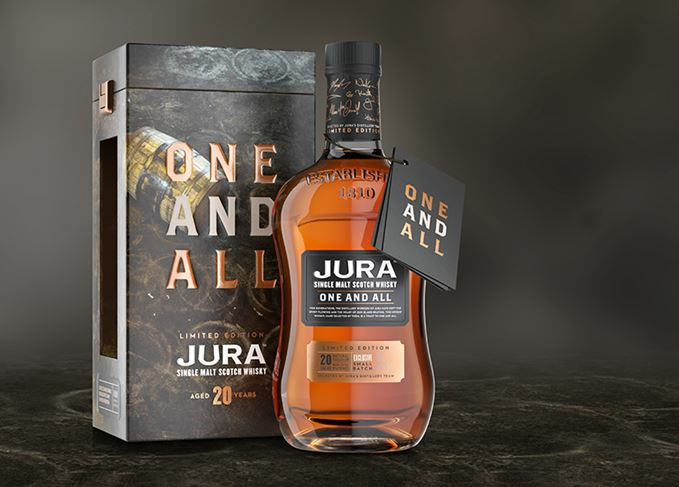 The Islay distillery has unveiled a new limited edition single malt release, named Jura One And All, to celebrate the island’s community. The 20-year-old small batch release, which is bottled at 51% abv, has been matured in ex-Bourbon casks, as well as ex-Sherry, Cabernet Franc and Cabernet Sauvignon casks, and Pinot Noir barriques – reflecting master blender Richard Paterson's love of wine casks. It was chosen in February by Jura staff as the distillery’s 2017 limited edition bottling, for its notes of ‘fruit, toffee, ginger spice, maple syrup, liquorice and white chocolate’. Around 200 people – or Diurachs, as Jura inhabitants are known – live on the Hebridean island and 17 of these work at the distillery – nearly 10% of the population. Graham Logan, who took over as distillery manager from Willie Cochrane last year, said: ‘There’s no better way to mark the distillery team’s dedication and craftsmanship, than by creating a limited edition expression in their honour – chosen by them. Established in 1810 and reopened in 1963, Jura is the sole distillery on the island, which also famously only has one road and one pub. One And All is available now, priced £120 a bottle, online and in shops globally (excluding US, Africa and Middle East).